Hence, until this day there has indeed been a fortified wall around this wisdom. Many have tried to begin to study, but could not continue for lack of understanding and because of the corporeal appellations. First, it all belongs to the past, when people were not developed enough. Therefore, as it says, “they ate unripe fruit,” which is very dangerous. An undeveloped person mustn’t be given information that is not suitable for his level. We see that the wisdom of Kabbalah is revealed in our times, that it is seemingly widespread and many people are attracted to it, each according to his preferences. There are those who try to use it to heal different illnesses, there are those who turn it into a religion, others turn it to mysticism, new age, etc. Everyone builds his wisdom from it, unless he is a part of a Kabbalistic group under the influence of a real teacher who knows what he is talking about, and follows the method relying only on the sources that he has received from his teacher. Unfortunately, there are many groups that study the wisdom of Kabbalah in the wrong way, or learn TES by heart as if studying Babylonian Talmud in a Yeshiva, or trying to extract some mystical powers from it. It is the natural inclination of a person who wants immediate results—to take the wisdom of Kabbalah and interpret it according to familiar terms, as any other science. So there were, are, and will be many more mistakes with regard to studying the wisdom of Kabbalah. But they are also included in the plan of creation. If a person doesn’t correct himself, but is still attracted to correction, but simply doesn’t fulfill it correctly, then he directs all the forces that were meant to help him in the process of correction in the opposite direction. In addition, others follow him into this empty study. Then later, after a long time goes by, they are finally disillusioned and accept this wisdom, not trying to profit from it, but loyally and rigorously carrying out what the books say or what they hear from the teacher. It is impossible to remain “free” studying this wisdom, since freedom at the moment means acting according to our ego. The wisdom of Kabbalah, however, is the concealed wisdom, it is concealed from a person and every new level revealed suddenly brings such internal changes to a person, which he cannot even imagine in advance. Therefore, one must work blindly here, and carry out all the conditions the teacher and the books speak about. Do You Know Why The Wisdom Of Kabbalah Came Into The World? There are two basic inner states: exile and redemption. In fact they both belong to spirituality, since you cannot feel that you are in exile if you don’t feel an echo, a reflection of redemption, which means if you don’t feel redemption in some way. Children who were born in prison or in labor camps in Siberia, sometimes lived there for years, unable to get out, and it was their whole world, the whole planet. Yes, they were told about some other life, but they lived and were brought up under the conditions in the camps, unable to see anything else. We learn everything from its opposite, it isn’t just a few differences, but in order to see a full picture it has to be diametrically opposite. If I want to attain love, for example, I have to reach hate, and the more hate, the more I can feel greater love, until it comes to the state of “love will cover all the sins,” and then it becomes absolute love. Is it possible to reach redemption without leaving exile? Is it possible to acknowledge exile without being attracted to redemption? All these states follow one another in different manners and styles and by that enable a person to find out exactly all the discernments in exile compared to all the discernments in redemption. It is only when these two pictures are placed one opposite the other that a big empty vessel is revealed, a burning desire, and also a great filling, which doesn’t put out the fire in the vessel. This is because in spirituality a person works in order to bestow, which means that he fills his vessel only in order to adhere to the Creator. Accordingly, in our world we also go through different corporeal states, as a replica of spiritual states. Here too there is exile and redemption, but everyone understands these concepts differently, regardless of the Creator and spiritual ascents, and sometimes regardless of the nation, the state, or a certain place. On the other hand, it may well be that “redemption” for us is connection in which we discover a good and happy life on a corporeal level, regardless of spirituality. In that case, we call the hate and the daily problems “exile.” A similar approach, without any explanations about spiritual roots is also legitimate when we turn to people. Baal HaSulam, ” Exile and Redemption”: The Creator will evidently show us that Israel cannot exist in exile, and will find no rest as the rest of the nations that mingled among the nations and found rest, and assimilated in them, until no trace was left of them. Even without knowing anything about the upper force, we see that there must be a system here that is clearly written. It is as if a long time ago a sage wrote about it in a book and now it all comes true. No matter what the Jewish people do, and wherever they are, fate will always follow them, control them, and bring about the distorted relations with its neighbors, with the world, and with ourselves. It has no rest. If this nation doesn’t want to see this system with its built-in software and program, which leads it from the beginning to the end, to the goal, then nothing will help us. On the contrary, if we delve into it, it will be clear that this it the Torah of truth. A transition from a corrupt state to a corrected state, Nature itself, by its development, demands this from us, and the wisdom of Kabbalah explains the phases and the states a person goes through on the way and the actions and the Lights that are part of the process. Woe to our nation if we don’t see the truth in this wisdom and don’t use it. Since then it still follows the same path in the same direction, but it advances in curves under a shower of blows, and by that extends time and increases the sufferings. In fact, the path is clear, and every move has its right time, and if I don’t fulfill it on time, then yesterday’s uncorrected part is added to today’s part and thus doubles the load. This part doesn’t disappear and we will still have to correct it, but under worse conditions, which stem from the lack of yesterday’s correction. If I don’t correct this today, then tomorrow, under the load of the last two days, the conditions will be much worse and I will have to do the work that is three times greater. Thus I constantly create greater and more difficult external problems, until I am totally surrounded by enemies who want to annihilate me. At home too, things are getting worse and the outside world surrounds us with hatred, so what can we do? It’s Time For Spiritual Action! Rabash; “Abraham Begot Isaac”: In the Mishna it says, “There are three things the world stands on, the Torah, labor and charity.” Abraham is called “a man of charity,” who devotes his power to do kindness towards people, Isaac is called “the pillar of labor,” who devotes his soul upon the altar. And Jacob is called “the pillar of the Torah,” as it says “give the truth to Jacob,” and the Torah is called the Torah of truth. And so every person should reach these three pillars. First these three pillars were revealed one after the other by our Holy forefathers, as each one revealed one pillar. And after the three pillars were revealed, it is also in our power to follow the same path our forefathers paved for us, and this is why we are called “The Chosen People,” because we have a merit that we have inherited from our forefathers, to observe the three pillars, by which the world can exist, which means that by them the world will exist and reach the goal for which it was created. This combination is done by a person’s choice. Thanks to the fact that a person chooses the right combination each time, he includes it inside him. A “human being” is the system that is made of two parts: a Light and a vessel, a desire to bestow and a desire to receive, and by the fact that a person who is between them can choose and determine the right relation between them, he creates a greater combination between the Light and the vessel inside him. A person’s work is to check himself and to learn from the Light. In order to do that, he already has to be incorporated of “three lines”: of the Light and the vessel and of the right attitude between them, only then will he be able to know what the Light brings him. This is called Abraham’s work, the first spiritual revelation in our work. Then we begin to work on the vessel in the left line, in order to understand what our matter is. It is possible to see the gap within the matter only if you have the Light and you know how to work correctly with the vessel. This means that the left line itself is also made of three lines in order to learn about the desire correctly—this is called Isaac’s work. Then there is the work in the middle line: a combination of the left line and the right line into one line, in order to know exactly what we need to do with these two forces. This is called working in the middle line, Jacob’s work, which is in the state of smallness in the meantime, in the root phase, phase one, and phase two. Then, after the attainment of the state of greatness on the third and fourth levels, this work is already called Israel. 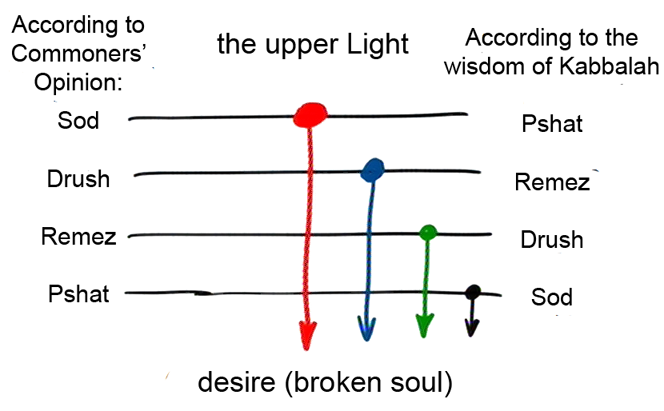 These are the phases of a person’s spiritual growth. A person who advances this way has what we call “patriarchal rights,” which means that he receives the method and fulfills it, and he belongs to the chosen people, since he works according to the “three lines,” understanding that he is the “middle line” that connects the first two lines. The middle line is called a human being and it is also called the Creator, Zeir Anpin, the middle pillar. On the whole, the middle line is the extent to which a person adheres to the Creator. It is impossible to work in Holiness, since Holiness is called bestowal. 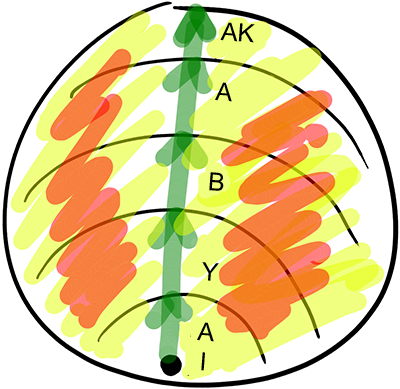 Bestowal is possible only in the right combination between the two lines: the right line and the left line into the middle line. Therefore it says that the world stands on “three pillars: on the Torah, on labor, and on charity” if we look at the process of the correction of the world on our part, from the bottom up. The Torah is the middle line, Jacob, the labor is the left line, Isaac, and charity is Abraham, the right line. My Comment: This statement looks like a mockery of all the attempts of the Israeli army not to harm the people of Gaza, even risking the lives of Israeli people. The truth is restated once again—the Jews are expected to correct the world rather than to become similar to other nations. The claims of the nations of the world that the Jews are the cause of all the world’s ills is fair because only they can correct the world. With the worsening of the global crisis, the nations of the world will increasingly put pressure on us and force us to carry out our business, the duty to the world and the Creator—to give an example for the world to unite in “Love thy neighbor as thyself.” We will have to realize this biblical instruction on ourselves, by consciously becoming aware of it or under strong pressure and suffering. The choice is ours. Why Can’t The People Of Israel Be Like Everyone Else? The entire Torah is divided into so-called: Pshat (simple interpretation), Remez (hint), Drush (allegory), and Sod (secret). They are not just the four parts of the Torah, but rather the four ways of explaining the methodology of correction in this world. These four languages are used by the Kabbalists to present to us the one and only method at four different levels. It’s up to us to choose the level that satisfies us: secret, allegory, hint, or simple explanation. In this world, these steps are turned upside down: a “simple interpretation” is believed to be just reading the texts, treating it literally. When one reads the text and doesn’t understand it at all, it is called “a mystery.” However, the thing is that we don’t understand what’s written in the Torah at all. Indeed, under Pshat-Remez-Drush-Sod is meant just the opposite. Pshat (simple interpretation) is the wisdom of Kabbalah, Sod (secret) is when this method of correction is hidden from us behind many layers. The Light of the Torah impacts us in accordance with these four steps. The maximum Light is enclosed in “the simple explanation” (the wisdom of Kabbalah) where everything is open to man and can be easily explained in a plain form. It describes a desire that is selfish by nature and thus has to be corrected. For that, we need the Light that Reforms. Bringing a selfish desire to the right (bestowing) intention is called “correction”; to achieve it, we have to participate in a group, unite with friends, and continue our studies in order to attract the Light. Most effectively, we attract the Light by working in the group, trying to suppress our egoism, connecting with each other above our selfishness and becoming as one man with one heart, and also by thinking about the Light that influences us and learning from the books how it acts and impacts our desires. The topic that we are studying, our actions that aim at self-correction, the prayers at the lessons—everything connects together and comprises the easiest method of attracting the Light that corrects coarse egoists (us) who are at the end of generations and at the peak of the egoistic development. If we don’t strive to attract the Light that Reforms to correct ourselves and if all we do is acquire theoretical knowledge instead of the Torah, then we are not aspiring to the wisdom of Kabbalah. It is said: “One should believe that the nations of the world possess the wisdom, but one should never believe that they have the Torah.” The nations of the world are those who strive to acquire knowledge rather than self-correct. At first, everybody goes through a state called the nations of the world until they recognize that their task is to self-correct, even if it happens in another lifetime, during the next reincarnation. Many people in history managed to attain spiritual revelation by studying the external parts of the Torah, the Mishnah, the Talmud, and not Kabbalah; that is, they used another language of presenting this wisdom. The entire Torah speaks about correction of a human being and that is the reason why the Torah was granted to us. Texts of the Torah describe the states that one goes through during one’s advancement to the Creator, attaining adhesion with Him, and acquiring similarity of properties with Him. The problem is solely in the way of presenting it, meaning, in the language. Ways of presenting this material are not equal relative to the Light that Reforms; each of them possesses a different intensity of the Light. The most powerful Light is in the wisdom of Kabbalah. They represent four layers, four filters that screen (hold) the Light on its way from top to bottom. The language of Kabbalah is pure Light. Kabbalah doesn’t limit the Light in any way, nor does it place filters on its way; Kabbalah doesn’t weaken the Light. Therefore, when one studies and denotes spiritual conceptions that refer to one’s soul, one elicits powerful Light that corrects him and brings him closer to the goal. If one studies the Torah presented in any other language, then the same ideas, the same Light, goes through filters and descends to a person in an extremely weakened form. Consequently, the “quantity” of the Light is not enough to correct a person. The four languages of the Torah: Pshat (simple explanation), Remez (hint), Drush (allegory) and Sod (secret) correspond to the worlds of Atzilut, Beria, Yetzira, and Assiya. If one studies the wisdom of Kabbalah, it is the teaching (Torah) of the world of Atzilut, the Light that Reforms descends to him directly. If one studies any other way, then depending on the method he chooses, he receives less Light. This is the way Kabbalah explains the division into the levels of Pshat-Remez-Drush-Sod, while the general opinion, is taken to the contrary, that Pshat (simple explanation), is the literal understanding, and Sod (secret), spiritual attainment. Baal HaSulam, “The Essence of the Wisdom of Kabbalah”: Indeed, if you take the body of a small animal, whose only task is to nourish itself so it may exist in this world for enough time to father and carry on its species, you will find in it a complex structure of millions of fibers and tendons, as physiologists and anatomists have discovered. And there is much there that humans have yet to find. From the above, you can conclude the vast variety of issues and channels that need to connect in order to achieve and to reveal that sublime goal. We have to include ourselves into the entire external reality. For that, we have to rise above ourselves. We ascend the ladder of the worlds of Assiya, Yetzira, Beria, Atzilut, and AK (Adam Kadmon) until we embrace all external desires and acquire the whole reality: the worlds, Partzufim, Sefirot, etc. We transform our intention to bestowing, and fill the space of the desires with a giving attitude (yellow), and to the degree of our intention to act so, we reveal the upper force in our intention (red). It’s as if we develop a photograph with the help of intention and take it out of concealment. Question: What in fact do we reveal out of concealment? Answer: The property of bestowal and absolute love that governs everything. We divulge it to the extent of our similarity with this quality, that is, proportionally to the degree of our bestowal, we disclose the same quality in the upper force which is hidden from us as of yet; thus, we unite and merge with It. We disclose bestowal to the extent of our ability to bestow. Conversely, if we are totally unable to give, we leave the upper force and become opposite and hostile to It. Everything is subject to the law of similarity of properties. Question: Let’s say, I become similar to the upper force in my qualities and disclose bestowal. What’s next? Answer: Nothing. You discover the cause that was hidden from you and influenced you “behind the scenes.” This “cause” is the upper force. Your goal is to discover It, and by doing so you please It. Then, you will become similar to It. In its turn, similarity with It will allow you to merge with It. What for? In adhesion, we will get the answer. We stay together with the Creator, we are similar to Him; our similarity with Him pleases Him and thus we boundlessly fulfill our vessels, and so on. In adhesion, words disappear; adhesion cannot be explained. Baal HaSulam writes in his article “The Giving of the Torah”: But if you linger on that word for even an instant, you will be overwhelmed by its wondrous stature. This is the goal that brings and focuses everything together.